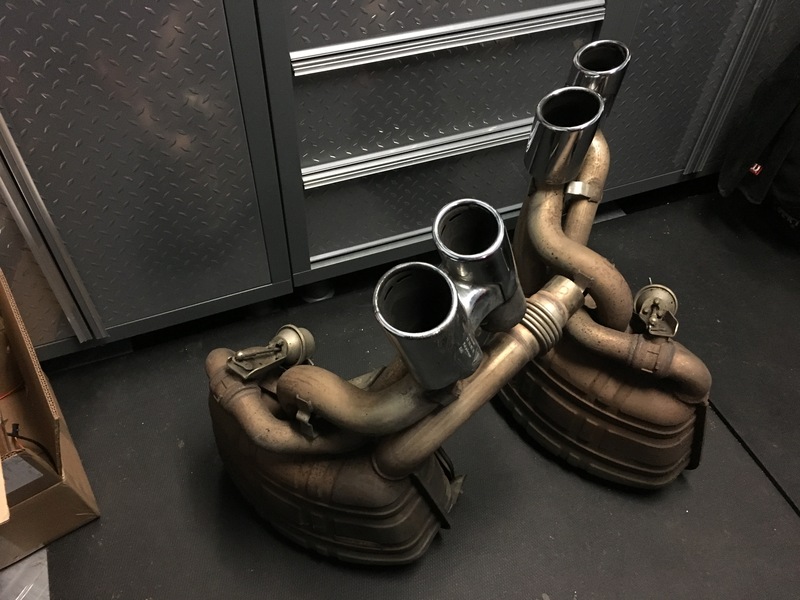 Porsche sport exhaust for 996/997 with chrome tips. I removed this from my 2008 C2 with 30k miles. Purchased from LA dismanters for $1,800. Great condition with minor scrape on bottom on tip. I have the PSE wiring/button setup if anyone needs that after buying the exhaust above. The 21 indeed has superseded the 19, and can in fact be installed on the 3.4. Took me about 90 minutes. You must take the mounting plate from the stock muffler and install on the PSE muffler. Then you must bend the inlet pipe to mate to the cat pipe. The inlet has a "bellows" to enable adjustments. My comments above were regarding the 996 kit. From the looks the 997 doesn't even have the clamp style to swap tips and tubes to the cats are longer. Lots of 996 PSE muffler sets on eBay though.